Women have a poorer quality of life after a stroke than men, a study has found. The US research, published in Neurology, assessed the mental and physical health of 1,370 patients three months and a year after a stroke. Women had more depression and anxiety, pain and discomfort, and more restricted mobility. UK experts said women tended to have strokes later, and might therefore need more support. 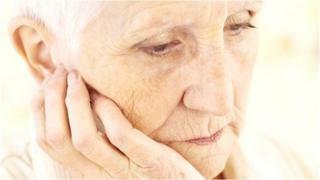 But the study did say more people survive a stroke now than 10 years ago because of improved treatment and prevention. The researchers at Wake Forest Baptist Medical Center, North Carolina, looked at patients who had had a stroke or transient ischaemic attack (TIA), also known as a mini-stroke. Quality of life is calculated using a formula that assesses mobility, self-care, everyday activities, depression/anxiety and pain. At three months, women were more likely than men to report problems with mobility, pain and discomfort, anxiety and depression, but the difference was greatest in those aged over 75. After a year, women still had lower quality-of-life scores overall than men but the difference between them was smaller. Prof Cheryl Bushnell, who led the study, said: "We found that women had a worse quality of life than men up to 12 months following a stroke." She said mood, ability to move about, and having pain or discomfort may contribute to the poorer quality of life for women. And she suggested that women may have less muscle mass than men before their strokes, making it harder to recover. She added: "As more people survive strokes, physicians and other healthcare providers should pay attention to quality-of-life issues and work to develop better interventions, even gender-specific screening tools, to improve these patients' lives." Dr Madina Kara, a neuroscientist at the UK Stroke Association, said: "This study shows that women fare worse after stroke compared to men. However, the reasons for this are not entirely clear. "It also shows that women over 65 are more likely to be living alone, which could be a contributing factor to their reduced quality of life, as they have inadequate support." She added: "We already know that women tend to have strokes at a later age than men, which lowers their chances of natural recovery post-stroke. "What this study highlights is that women may not be getting the support they need to improve their quality of life after stroke. "It is essential that all stroke survivors receive the best care and support from health and social services to make their best possible recovery."